Secondly if your reading this because your intrigued if this product works or not…wonder no more – It works! Thirdly they really should replace ‘exfoliating socks’ as a product description, it doesn’t really cut it – ‘Magic socks’ maybe a better one haha…. So I bought this product for my Mum, as like me she has dry skin – but worse. 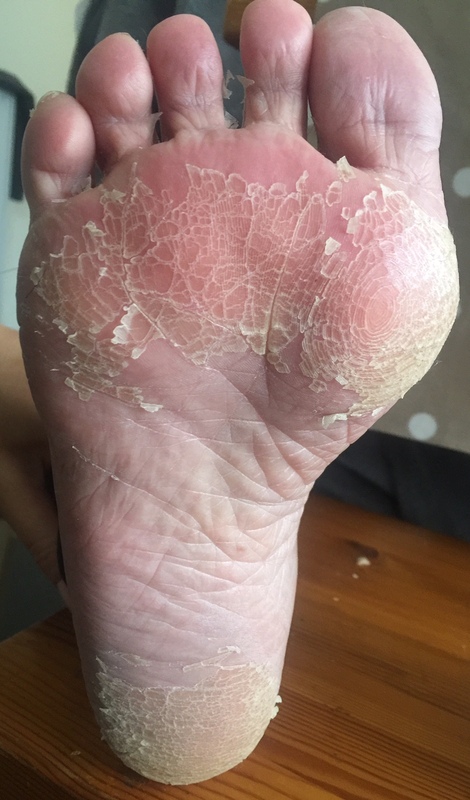 My Mums skin and feet only ever go ‘normal’ in humid, hot climates….and as we live in the UK, that means her feet are almost always EXTREMELY dry and cracked. So this was to be the ultimate test for the product! 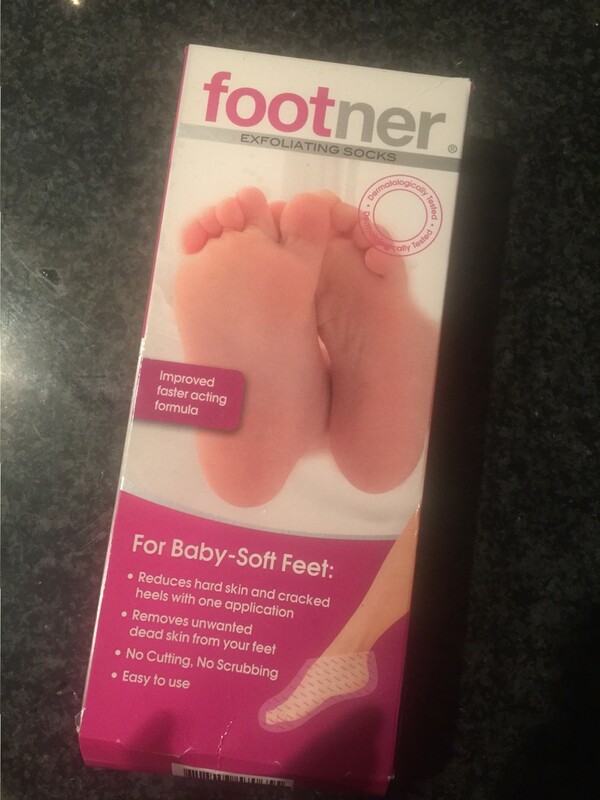 So in theory Footner, like ‘babyfoot’ – the international version of this product is like a peel for the feet. 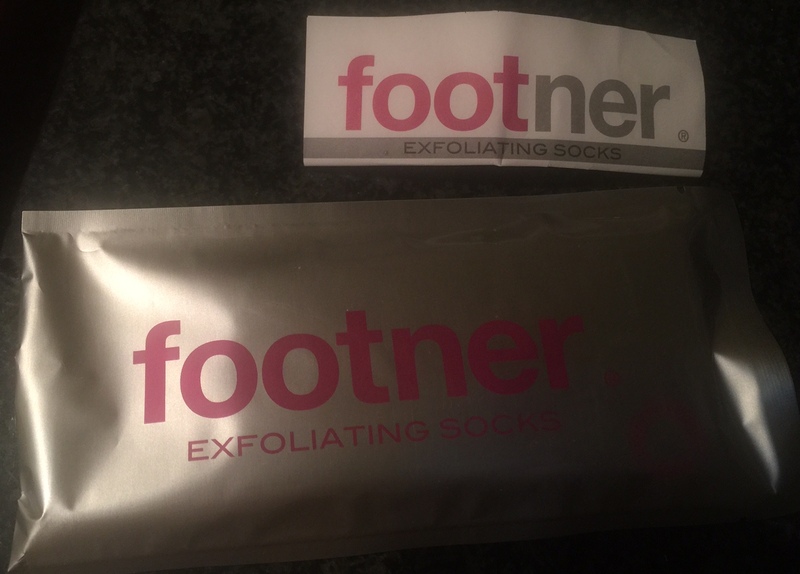 Footner Exfoliating Socks activate the skin’s peeling effect causing the upper layer of the skin to peel off, thereby removing the hard callus build up. Almost like ‘dissolving’ the stuff that keeps the hard skin together, but keeps the healthy fresh skin underneath in tact. The exfoliation process begins 1-7 days after wearing the socks and should end within 10 days after application. After just one 60-minute application of the socks, your feet should exfoliate the hard callused skin and leave you with baby soft feet. 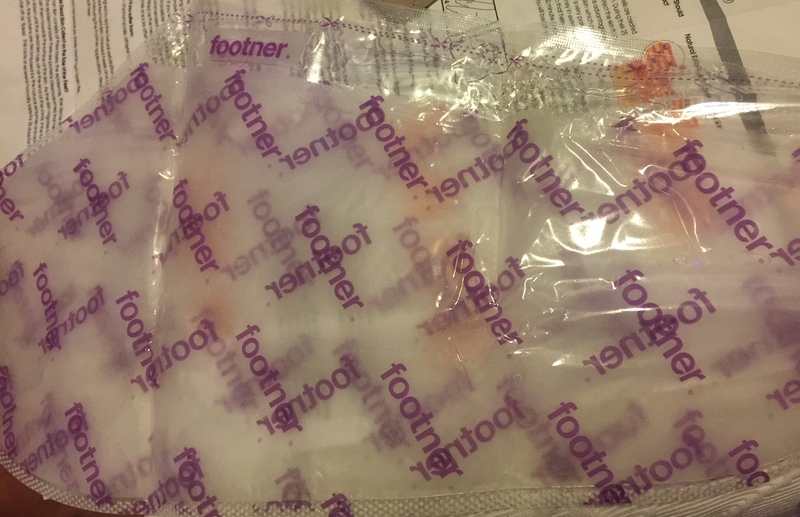 So in the packet you get these two plastic socks lined with the ‘peeling’ agent. You cut off the top, slip your feet in and use the tab the secure the top. As I said as my mums feet were very dry and she left her feet alone for a few weeks prior to this treatment so we could really test how extreme this works. 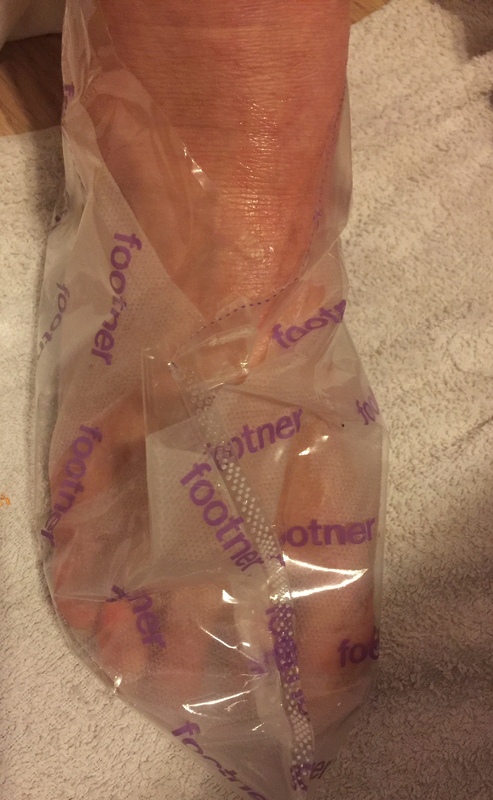 Because of this we pre soaked her feet and dried them prior to putting the socks on as many people have suggested in the product reviews! We also applied vaseline to the top of her foot so the product didn’t get on it too much. When putting the socks on she said the solution felt cold. She then sat still for 1.5 hours, although when she needed to get up she had to put her regular socks on top of the plastic so she could walk – and even then she felt like she was sliding everywhere on the wooden floor! When it was time to take them off, she rinsed her feet off, patted dry and over the course of the next week or so she kept her fee moisturiser free! Now as predicted my Mum spent the first few days when nothing had happened ( other than her feet feeling a bit tight) saying ‘I don’t think this is working you know’, even though I could see white, dry lines appearing all over her feet. 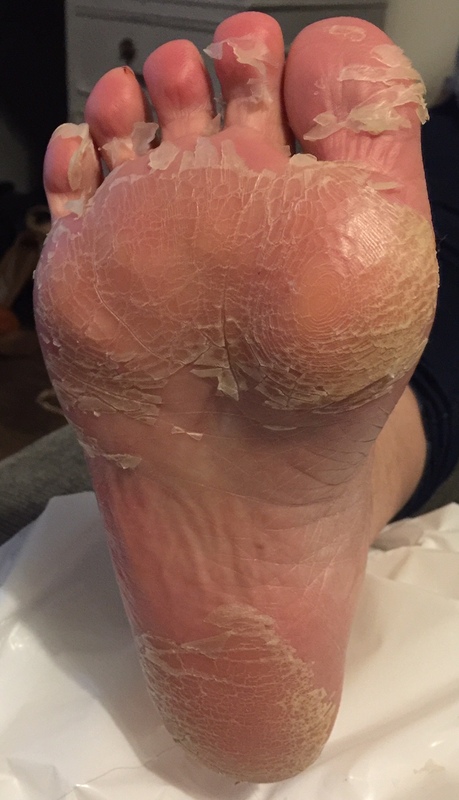 Until on the 4th day her feet began to peel, from the top of the foot, downwards in-between her toes, to the sole of the foot and lastly 9 days later the heel and the ball of the foot. So effectively thin skin first, thick skin last. 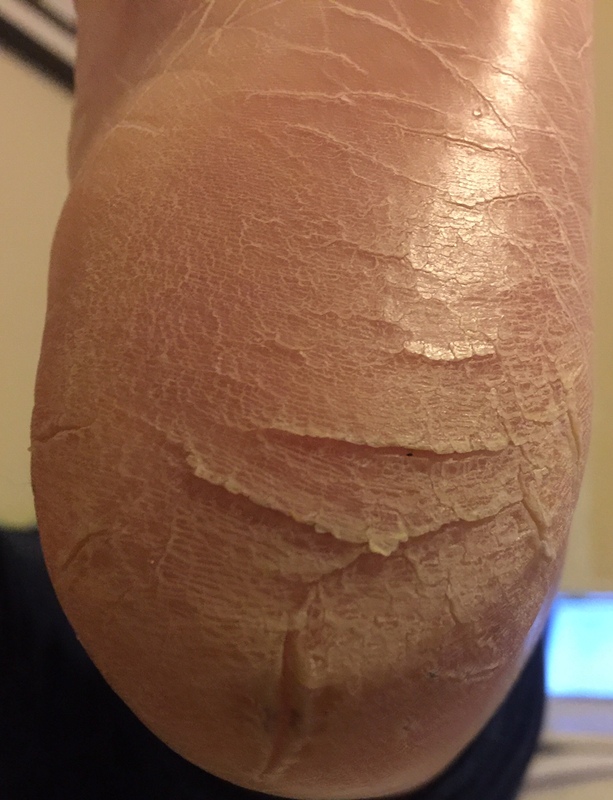 What I will say is the last bit of very very dry and thick skin didn’t come off completely, but did with a bit of a sand! One tip my Mum says, Always wear socks and NEVER wear tights you don’t want to throw away! Socks keep the skin from falling off around the house ( yuck!) and tights apparently just gets caught up and snagged on the feet! So beware and plan carefully when your going to use it. Also, she found when she showered putting a plug in the bath and just letting the water soak her feet sped up the process. So with Summer coming up and the flip flops coming out I can absolutely recommend this product, Even I, as a non-sceptic am absolutely amazed and how its left my mums feet baby smooth – never in my ENTIRE life, and my Mum assures me in her life too have we ever seen her feet look and feel like that! Do not hesitate to buy this! Footner, Around £20.00 from various outlets including larger Boots stores.